Notes from MishaFox: This map is tentative. The light blue lines are country borders. Aside from Marigund all of those borders are strictly tentative. I did add in some town names, too. Sovereign: Duke Otakar of Salinon . An older (no longer used) Cenetli term is Ard-Rí which mean High King. Climate: The Outer Midlands are far inland, so their winters are long and cold, the summers blazing hot, and the springs and falls are wet and muddy. The real-world climate equivalent is the Ukraine. Government: Feudal alliance of semi-autonomous city-states and manorial estates all of which are under the ultimate control of Salinon. 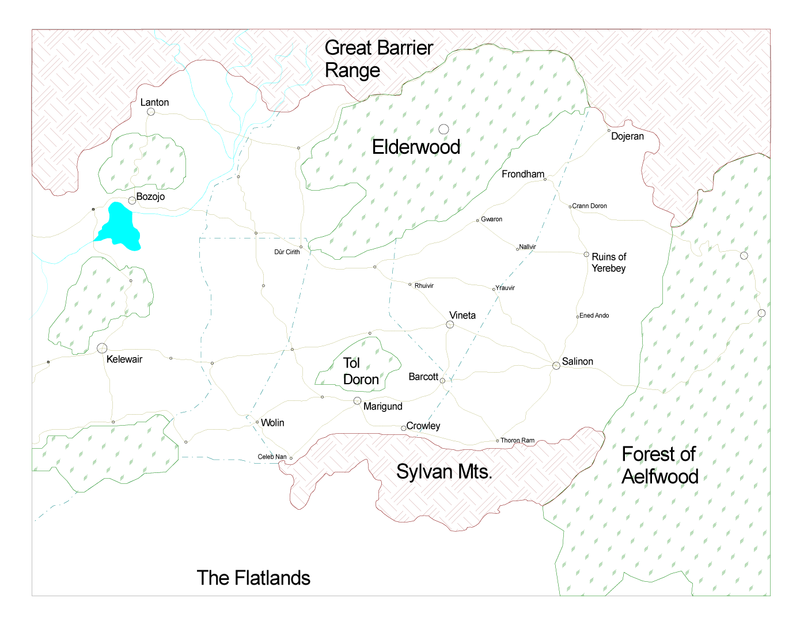 Borders: North Great Barrier Mountain range, South: Sylvan Mountains and the Flatlands, East: Aelfwoods, West: Southern Midlands. 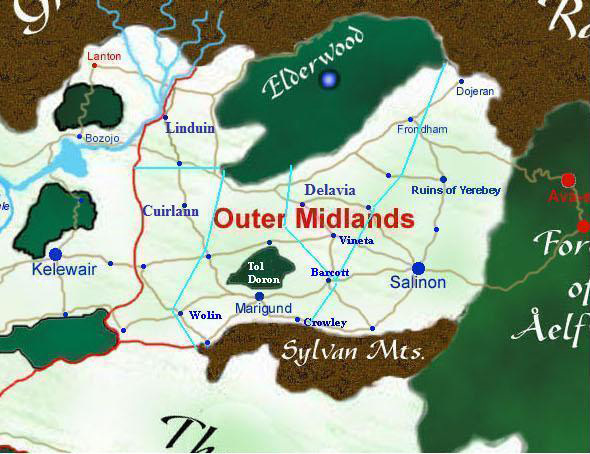 The Outer Midlands were under Elvish rule for thousands of years longer than any other human region. When the Sun Elves withdrew from the rest of Galendor after the war of the Great Darkness, they retained their holdings in Aelfwood, the Sylvan Mountains, and what they called Dûn Fennas (the "Gates of the West"), which is the present-day Outer Midlands. These regions comprised the kingdom of Quenardya from about -4000 CR to 400 CR. The population was about 70% human, 20% half-Elf, and 10% elf for most of this time. Quenardya held firm against the rise of the suielman-empire and against the lutin invasions that precipitated the Empire's collapse. When the Southern Midlands were liberated by King Andrew in the late second century, the Elves decided to withdraw from Dûn Fennas and leave it in the hands of their human subjects. Rather than pull out suddenly, though, as they had from the rest of Galendor, they took their time with Dûn Fennas. They spent several human generations teaching them self-governance and raising up responsible, capable leaders. They then began granting autonomy to various city-states within the region, as the humans became capable of handling it. Some of these governments were overthrown, but others succeeded and prospered. Yerebey was the last Elven outpost to remain in Dûn Fennas; when it was destroyed by a human warlord named Herouc who had risen to power in the region, the Elves finally withdrew completely into Aelfwood and the Sylvan Mountains. The Outer Midlands retain certain trappings of their long centuries of life under Elvish rule. The oldest buildings and writings are all of Elven make, and many of the technical terms used in the language of politics, law, magic, religion and medicine are Elven loan-words. In the last 400 years the Outer Midlands have adopted Common as their main tongue so as to more closely integrate with their western neighbors, but their accent retains distinct evidence of Elven pronunciation. Today Fennasi civilization is a blend of traditional Cenetli culture, Elvish influence, and Suielman traits picked up through interaction with their western neighbors. While the Fennasi are proud of their heritage, they have had no contact with the Elves for over 150 years, and the current generation views the Elven lands to their south and east with a mixture of wonder and fear. While soldiers on horseback regularly patrol the borders of these lands, the common people consider it bad luck to get too close to them. Everyone avoids the Ruins of Yerebey, and it is said that any human who trespasses on that ground will fall under a terrible curse. The Outer Midlands is home to an impressive array of wild animals and plant life. Large parts of the Outer Midlands are still wild and rarely see more then a handful of people a year. If that many. Prairie grass: The single most abundant plant life. Not one species but many. A count by agriculturalists/mages shows over 215 species of grasses (and the list is far from complete). They range from varieties that grow only an inch high to others that can get as high as 5 to 6 feet tall. Some known varieties include: Big Bluestem, Blue Grama, Turkeyfoot, Bush clover, Blue eyed. Others: Other plants known include Stinging Nettle, Purple Corn flower, Milkweed. Fleabane, Wild Indigo. Goldenrod. Trees: Some known species include: Oak, elm, ash, yew, apple, birch, the larch. Grains: Wheat (several different types), barley, corn are among the species that grow here. Intensively farmed but also present in the wild. Horses: There are several types of horses native to the area both wild and domesticated breeds that have escaped into the wild. Some known breeds include: Tarpan, Mustang. Deer: There are two main species of deer known including the White tailed and Elf deer (which is not really elvish). Cattle: Both wild and domesticated breeds gone feral. Fox: Most commonly found is the swift fox. Gray-brown in color. Wolf: The most common predator is the prairie wolf. More commonly known as the coyote. Cougar: Only present in small numbers usually in the wooded or mountainous sections. Bear: A small brown colored bear (basically a black with with different markings) is common on the open plains. But the black and grizzly bears are present only in the mountains. Rabbits: Very common and being close to the bottom of the food chain means they are hunted by just about everything. they are a common part of the diet of local farmers. Birds: There is a surprisingly wide variety of birds in the area ranging from sparrows and bobolinks to owls and harriers. And surprisingly at least 1 race of wild chicken. A common bird is the Plains chicken - also known as the Prairie Chicken. Insects: Ants, bees, spiders (normal sized), ground dwelling hornets are among the known species. Sheep and Goats: Not native to the region but many have escaped from farms over the years and gone wild. They exist only in small groups since they exist at the bottom of the food chain.. The Outer Midlands has several species that be classified as unusual. Either by nature or creation or both. Giant Spiders: These are larger then the usual tiny sized insects and can range from those about the size of a rat to the Plains spider which is the size of a wolf! Fairly rare. They are more common around elderwood and are believed to have originated there and somehow escaped that evil place in the past. Another thought is that the Plains spider is the real, natural spider and the Elderwood spider is a corrupted version. The elderwood-spider is remarkable for it's size and viciousness. Thankfully the Spiders of the Midlands lack the later trait. They mostly avoid humans. Powerful hunters they can be trained and the Rat spider is prized in some places for its habit of eating vermin. Mage leopard: A more recent appearance and very rare. They look like a leopard in size and markings. They are smarter then normal leopards (but just short of human level) and are stronger and faster. The most remarkable thing is that they use magic. They have been witnessed using low level spells (level 1 & 2). They seem to cast this magic instinctively and the older the animal the more powerful the magic. Regular leopards are a warm climate animal but the Mage leopard thrives in spite of the cold winters. How they came about is a mystery but tales of their creation usually involve a mage either creating them or becoming the first one. A study of them by the Marigund mages guild has led to the beleif that they were created by a magic user who decided to 'improve' the leopard. Most commonly found near the Aelfwood but 1 mated pair has been sighted in Tol Doron. See also mage-leopard. Doron wolf: Extremely rare and known to exist only in the small forest of Tol Doron (thus the name). They resemble timber wolves but are larger. Little is known about them and they are the subject of considerable myth and legend. One popular legend is that they are legendary heroes reborn into the world. Just seeing one is considered a good omen. Hunting them is banned by law and liable to get the hunter being chased by an angry mob. The Marigund Mages guild has confirmed the existence of the creature but so far has uncovered little solid data. See also Doron Wolf. Aldadraug: The name means Tree Wolf. Most notable for their green and gray coloration! Found only in and near the Aelfwood. Some people believe they are elves shapeshifted into wolf form. They are known to be able to climb trees. 1. The descriptive term for something or someone from Dûn Fennas is Fennasi; this word functions both as a noun and as an adjective.